When it comes to the news media overall, younger Europeans – those ages 18 to 29 – trust the news media less than adults in the oldest age group (those 50 and older) in five of the eight countries in Western Europe included in this survey. But, this does not mean that younger Europeans are unable to find particular outlets that they use or trust in their respective countries. Even while distrusting the news media at higher rates, younger adults nonetheless trust specific newspaper and magazine brands as much if not more than those older than them. In five of the eight Western European countries surveyed, younger adults trust the news media less than those in the oldest age group. 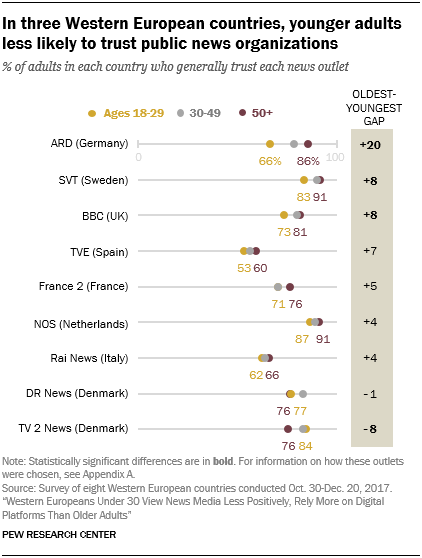 The largest gap between the youngest and oldest age groups is in Germany, where 54% of those ages 18-29 trust the news media, compared with 68% of those 50 and older (and 63% of those 30 to 49). There are also gaps in trust between younger and older adults in the Netherlands, Sweden, Denmark and Spain. 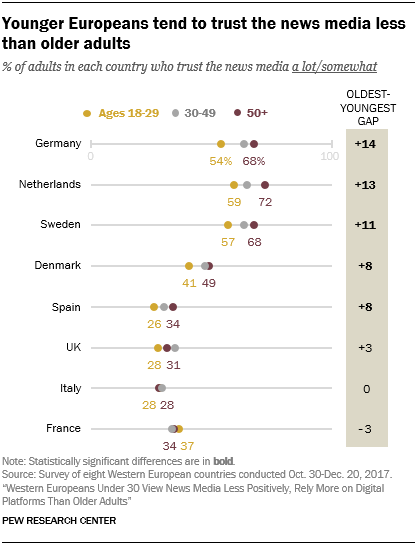 In Germany, the Netherlands and Sweden, even while younger adults tend to trust the news media less than older adults, more than half of those under 30 still trust the news media. For example, in the Netherlands, even while younger adults trust the news media 13 percentage points less than those 50 older, around six-in-ten Dutch adults ages 18 to 29 (59%) say they trust the news media. In the UK, Italy and France – where trust in the news media is relatively low, particularly in comparison to northern Europe – younger and older adults trust the news media at similar rates.4 For example, in Italy, only around a quarter of each age group say they trust the news media (28% of those under 30, 29% of those 30 to 49 and 28% of those 50 and older). While younger Europeans tend to trust the news media less than older adults, the same is not true when it comes to trust in specific outlets (see Appendix A for more information on how the outlets were chosen). In fact, for some outlets, 18- to 29-year-olds trust them as much if not more than those ages 30-49 or 50 and older. Younger Europeans – who tend to rely on specific newspapers more than older adults – also tend to trust these outlets at higher rates than adults ages 50 and older. For example, in France, younger adults trust each of the four newspaper brands asked about – Le Monde, Le Figaro, Libération and L’Express – more than those in the oldest age group. These gaps in trust can be substantial, with younger people at least 14 points more trusting of each of these sources than those 50 and older. In the case of Le Monde, there is a 35-percentage-point gap in trust; nearly three-quarters of those 18-29 (73%) trust the outlet, compared with 38% of those 50 and older. When it comes to trust in public news organizations, though, there are few differences among the age groups. In four of the eight countries surveyed – Spain, France, Italy and the Netherlands – all age groups are about as equally likely to trust public news media. In three countries – Germany, Sweden and the United Kingdom – those under age 30 are less likely than those ages 50 and older to trust public news organizations in their countries. And, in Denmark, where people were asked to evaluate two public outlets, younger adults are more likely to trust TV 2 News than those 50 and older, while they exhibit similar levels of trust in DR News as those 50 and older. But, in all countries – even the three where those under 30 trust the outlets less than those older than them – about half or more of younger adults in each country still trust the public news organization.